CBR YouthConnect is so excited for what is coming in 2019! A new year brings so many new opportunities. 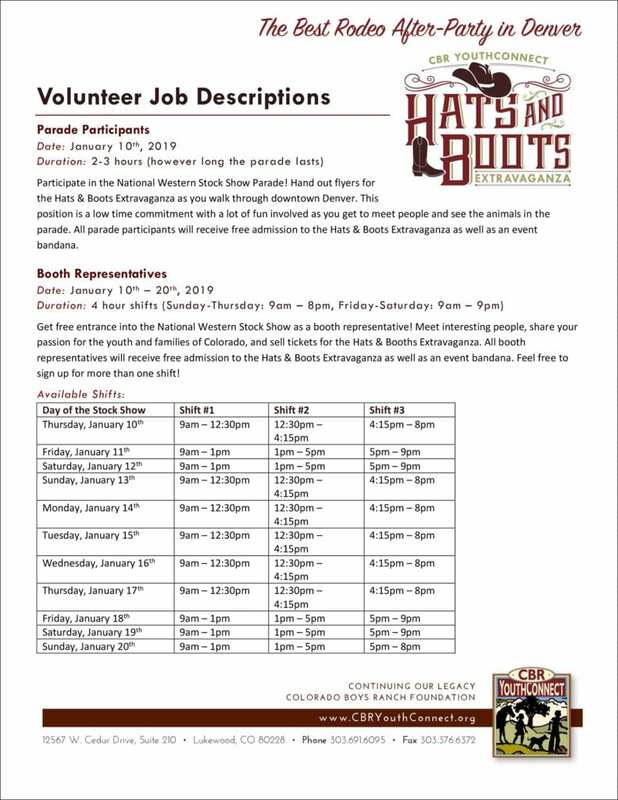 One of these new opportunities is the Hats & Boots Extravaganza! This after-party to the National Western Stock Show on January 18th will be a night of eating, drinking, and dancing. With six different activities (mechanical bull, quick draw, etc.) to choose from, this fun-filled night will be one to remember! However, we need help to make sure everything goes as planned. This means that we have a multitude of volunteer opportunities beginning in January. All volunteers will receive free admission into the Hats & Boots Extravaganza as well as event bandanas. Click on the descriptions for all of the volunteer positions below (a PDF file will download). PLEASE NOTE: All volunteers are required to attend an informational training meeting on January 5th. If you cannot make this meeting it is possible that we may hold another meeting one evening the week of the event. If you or someone you know is interested in volunteering for any position, please click here and enter Volunteer in the message field. Thank you so much and we hope to see you at the Hats & Boots Extravaganza!